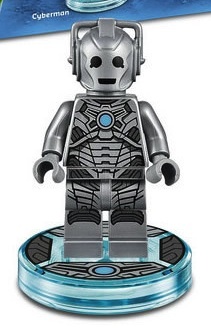 A Cyberman is a minifigure and a character that appears in LEGO Dimensions. The Cybermen were cyborgs from the former twin planet of Earth, Mondas. Due to being knocked out of orbit, the people of Mondas had to become Cybermen in order to survive. However, the Cybermen later became corrupted. They wanted to upgrade the rest of the galaxy, a process which not only erases emotions, but is irreversible. Those that refuse to upgrade may be killed by the Cybermen. Because of their conquest, they have become a common enemy of The Doctor. A Cyberman in LEGO Dimensions. This page was last edited on 19 February 2016, at 08:56.